Every new stargazer thinks the first thing they need to get started in astronomy is a telescope, only to discover that they don't know how to find anything with it in the sky. The problem, of course, is that they don't know the bright stars and major constellations. Unfortunately, many never find the help they need and give up astronomy and stick their telescope in the closet. With proper advice and guidance, anyone can turn into a star-hopping skymaster. The first thing you need to learn your way around the sky is a star map, but what kind? You won't want to get a star atlas like Wil Tirion's Sky Atlas 2000, it's way too detailed. Good places to start are the monthly all-sky star maps that appear in Astronomy or Sky & Telescope magazines. You can also download a free monthly star map from Skymaps.com. Those will help you pick off the most common star patterns like the Big Dipper, Orion, and the Summer Triangle. Those are set for one time of night though and that might make it difficult to track down the dim and small constellations. The best type of star map to start out with is a planisphere. This is a star map that can be adjusted for the date and time you are observing the heavens. I think the best type of planisphere to get is the Miller Planisphere. These are made of plastic, so they won't peel apart or fade when you're using it under damp conditions. They come in a large and small size. The larger size costs more of course, but it's easier to read in the dark. There are many types of planispheres and any should serve you well. Once you find a star map that's right for you, you have to figure out how to read it. Trust me; it's easier than reading a road map! The first things to look at are the parts of the map. I'm going to use THIS star map. The most obvious parts of the chart are all the little dots that represent the stars. You'll notice that the dots are different in size, big dots are bright stars and smaller ones denote faint stars. Most of the stars on the map are connected by lines. These are the imaginary lines that show us the general structure of the constellations and asterisms. The brightest stars and most of the constellations and asterisms are labeled, so you know what they're called. The large circle around the stars represents the lowest point in the sky, which we call the horizon. It's where we see the Sun, Moon, and stars appear to rise and set in the sky. If the circle represents the lowest part of the sky then where on the map do you suppose the highest point in the sky is located? If you guessed the very center of the chart then you're correct. This is called the zenith or in simple terms "straight up". Outside the circle you'll see the letters N, S, E, and W at 90° angles to one another. These are the cardinal directions north, south, east, and west. Hopefully you've heard of these by now because it's vital to know your directions to find star patterns and deep sky objects. 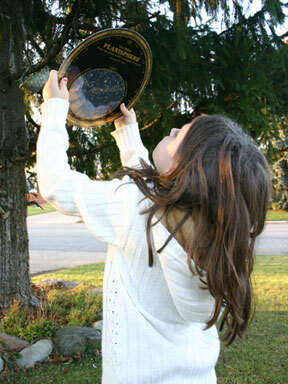 Once it gets clear and dark, take the star chart or planisphere outside. Before you can begin searching for constellations you have to find your directions. What do you use in the night sky to find directions? The answer is, of course, Polaris or "the North Star". During my experience working at a planetarium many people have pointed to the brightest stars or planets in the sky when I ask them to find Polaris. I suppose it's natural to assume the north star must be bright and easy to find since it's so well known and useful. It's not bright (it ranks 49th in brightness), but it is easy to find. You just have to know the trick. Without a star map, anyone should be able to find "The Big Dipper", the most famous star pattern of them all. What you're looking for is a group of seven stars that form a drinking cup with a long handle. Its stars are bright, so it should be easy to find. Once you locate it use the two stars at the farthest end of the bowl. These are called the pointer stars, because if you trace a line straight out (with a little error) you'll come across a star of similar brightness to the pointer stars. It should be Polaris. If you're not sure if you've found Polaris just take a break and go inside for about a half an hour. Go back outside and see if the star you believe to be Polaris has moved. If it didn't move then you've found it! Drawing a line straight down to the horizon points directly north. The good thing about directions is that when you find one the others are a snap. As you face north, south is directly behind you, east is to right, and west is to your left. The last thing you need to know before we begin searching for constellations is how to hold the star map. Go ahead and point the map so north on the map faces north in the sky. You'll notice that north and south match up, but east and west do not. To hold the star chart simply hold the map up, over your head, until all the cardinal points match up. Holding it the regular way will be fine though. Just remember that east and west are backwards. Now that you've found your directions you're ready to track down the stars and constellations. First thing you need to do is pick a constellation. Since the star map above is for spring I'll pick Leo "the Lion". This method will work for any constellation at any time of the year though. The first step is to draw a line with your finger from the zenith, through Leo, to the horizon. This tells us the direction we should look at, which in this case is southwest. Next, draw your finger back up the imaginary line we drew to Leo. You'll notice that Leo is about a third of the distance from the zenith or two-thirds from the horizon. So that's where we look in the sky, southwest and two-thirds up. Fortunately Leo has a bright star named Regulus, so that should make it easy to find. The "head" of Leo also has a distinct backward question mark shape to it. This backward question mark is also known as the Sickle, which is an old farming tool. To the left of the sickle is a right triangle of stars that forms the rear-end of the Lion. The star at the point of the triangle is Denebola, which in Arabic means "tail of the Lion". Once you've mastered this method, you should be able to find anything you want in the sky. It just takes practice. Besides reading a star map to identify the stars and constellations, there are dozens of little tricks and limericks that will help you learn your way across the sky. There aren't tricks for every constellation, but they will help you find the more difficult constellations. You can find your first constellation by finding the Big Dipper. Most people think the Big Dipper is a constellation, but it's not. It's merely an asterism, which is an "unofficial" star pattern. What I mean by unofficial is that back in 1928 the International Astronomical Union adopted 88 star patterns that we now recognize as the modern day constellations. When you find the Big Dipper in the sky you are also looking at part of Ursa Major, the Great Bear. Ursa Major includes all seven stars that make up the Big Dipper and many more surrounding stars. See if you can find the stars that represent the bear's ear, nose, belly, three legs, and three paws for yourself. To find another constellation we once again use the pointer stars in the Big Dipper and trace to Polaris, the North Star. The North Star is at the end of the handle of the Little Dipper. Like the Big Dipper, the Little Dipper is part of a constellation known as Ursa Minor, the Lesser Bear. With the long tail, the Lesser Bear looks more like a squirrel than a bear! Continue your line through Polaris and you'll come across a W-shaped constellation. This prominent constellation is called Cassiopeia, an ancient queen of Ethiopia. We can find yet another constellation using the pointer stars, but this time we'll draw a line in the opposite direction. We once again come across the constellation Leo, the Lion. So we didn't have to use the star map to find Leo at all. A simple little trick lead us right to it! Believe it or not, there's one more trick that involves using the Big Dipper. Instead of using the pointer stars we'll use the Dipper's handle. The handle has a bend, or an arc, and if we follow the arc it leads to a bright orange star named Arcturus. To remember this little trick we say "follow the arc to Arcturus". Arcturus is the brightest star in the constellations Boötes, the Herdsman. The occupation of herdsman is a rare one nowadays, so it's difficult for us to visualize the pattern in the sky. Instead of a herdsman, try imagining Boötes as a kite. Arcturus represents the beginning of the kite's tail. A popular envision for Boötes among children is an ice cream cone. Arcturus is the tip of the cone and there's one scoop of ice cream on the cone. To the east (right) of the first scoop is another scoop of ice cream that just fell off. This "other scoop" is the C-shaped constellation Corona Borealis, the Northern Crown. That's two more constellations that can be found using the Big Dipper. There's one more. Continuing the arc past Arcturus, we come across the bright blue-white star, Spica. To remember this part we just add to our memory trick. Now we say: "Follow the arc to Arcturus and drive a spike to Spica". Spica marks the upper leg of Virgo, the Virgin. Above Spica, is a Y-shaped pattern of faint stars. These are Virgo's outstretched arms, reaching up to gather the warmth of the Autumn sun. Once you feel you've mastered the art of reading a star map and that you've learned as many of the limericks and memory tricks of finding the constellations, try and prove it. A great way to really know the constellations is to draw them. Don't just draw dots where you see stars, but try labeling the dots according to brightness. You can either make big dots for bright stars or label the stars by number, one being the brightest. Be sure to record any other noticeable features like color. Once you begin exploring the cosmos through a telescope you'll find that your eyes have become more trained to see detail than when you took your first glimpse through an eyepiece.